*** Towanda Winter Savings Sale *** Work Truck, Horse Trailer, ERTL Die-Cast Collection - Display/Showcases, Vintage Items & More! Harley Davidson Collectibles, Projectors, Showcases, Display Cabinets, Clothing Racks, BARBIE/WIZARD OF OZ, ERTL Collectible Die Cast Banks, Phillip 66 Items, Frankoma Dishes, Porcelain Dolls, Bike Parts, DENTAL MEDICAL HEAD and More! SPECIAL NOTE: LOT NUMBERS 2000-2008 ARE PICK-UP from 3pm-5pm ONLY on Saturday 2/2. Please call with any questions. Vintage Ironing Board - Stands to Iron, Fold Flat to Store! Cool! Vintage Tri-Footed - Floral Printed Dish - Beautiful! Commercial Special Purpose Dehumidifier - DRI-EAZ M#F203 - Runs! LARGE Custom Made Locking GUN Display Cabinet - SOLID! Glass Door - w/ key! AWESOME PIECE! 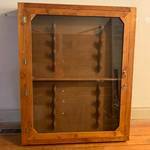 Large Cabinet to display your collection. Locking with key. Lighted Showcase - Glass Shelf included - Well Built! Light works - Storage below in back of case - NICE! Lighted Showcase - Well Built! Light works Storage below in back of case - NICE! Hanging Display Case / Flat Cabinet - Locking Doors with key! Nice! Wooden Cabinet on Casters w/ 5 shelves - Rolls Nice - Well-built! Lighted Showcase - Well Built! Light works Storage below in back of case - drawers and sliding door - NICE! Amazing TALL Display Case - Over 7.5 feet tall! - On wheels! - Sturdy built - Nice Condition! Gotta see this one! Set of 3 VINTAGE WOODEN Theater Seats - From approx 1930s - All work - Check em out! Set of 2 VINTAGE WOODEN Theater Seats - From approx 1930s - All work - Check em out! This is a solid, custom cabinet made at the Wichita Eagle for storing negatives, plates and compositions for the newspaper. It was saved from the building demolition and is now for sale! Drawers Glide very smooth. It's a heavy duty, solid cabinet! Chairs are clean and mostly in good condition. There are a couple that need TLC. Please come to the inspection to take a look. Trailer sold with auction receipt only. No title. No bill of sale. Note: Trailer shown in photos that rack is sitting on is NOT included. ERTL - Truck Coin Bank - Phillips 66 Petroleum Company - 1/34 scale 1932 Ford Powder Truck "Geologic Dept." w/ KEY - NEW IN BOX! Flat of ERIE Resistors - In Retail Packaging! Assorted Watches - It's About That TIME! Coca-Cola Plastic Drink Mug - See Photos for Measurements! Note: pump pedal is loose, wouldn't latch on hydraulic cylinder to lift up. Please come to inspection to preview this item. Coleman Battery Operated Lantern - WORKS! Here's another one! Dental X-Ray Trainer By Rinn / Human Skull Model 54-6002 - mouth mechanics work!! Very valuable and collectible! Projector - No cord or cables - See Pics - NEC M# NP-M300X - note powers on beeps 3 times and shuts down. Google says new bulb needed? SHIPPING NOTE: Please call BEFORE bidding to see if and item can be shipped!!! Shipping is available only on certain small items on this auction. Items will be shipped via USPS Priority Mail for actual shipping charges PLUS a $5.00 packaging/handling fee. Must be prepaid via credit card (or PayPal) on a PayPal invoice.